I was happy to run across these two video clips posted by one of my Facebook friends. They feature my archaeology professor Gabriel Barkay who is best known for his discovery of the silver scrolls, the earliest fragment of the Hebrew Bible. In a wide-ranging interview, Dr. Barkay talks about the the forgery of archaeological artifacts. He discusses why people do it, the problems it causes and how the problem should be confronted. He also gives some opinion on how scholars should treat unprovenanced artifacts. With the recent discovery of the so-called "Gospel of Jesus' Wife" and the Lead Codices last year, this interview provides a good context for understanding what is at stake. 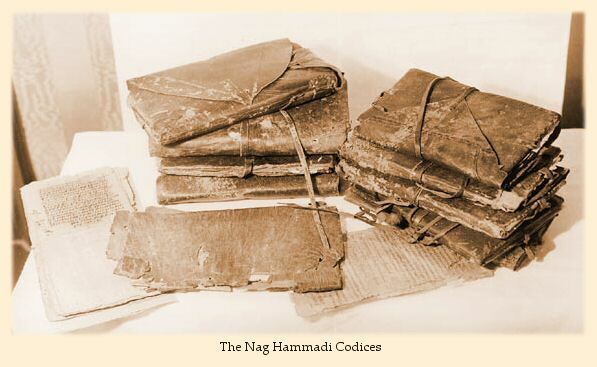 Lost Gospels: What are they and do they matter? The recent announcement about the so-called "Gospel of Jesus' Wife" has, once again, ignited interest in the non-canonical gospels. People are once again asking about the Gospels of Thomas, Judas, Philip and others. Many want to know if these gospels actually exist and if they do what does it mean for the New Testament and Christian faith. The BBC radio program All Things Considered recently produced a program that looked at this topic. The program features two of my former Durham classmates, now colleagues, Simon Gathercole and Augustine Cassidy. I think the the program is a fair, balanced look at the topic and will be helpful to many. Today I continue to give some sneak previews of my commentary as I give consideration to the thanksgiving section of Paul’s second letter to the Thessalonians. We ought always to thank God for you, brothers and sisters, and rightly so, because your faith is growing more and more, and the love all of you have for one another is increasing. 4 Therefore, among God’s churches we boast about your perseverance and faith in all the persecutions and trials you are enduring. One of my favorite Jimmy Stewart movies is the 1965 film Shenandoah. Stewart plays a hardworking Virginia farmer trying to take care of his family in the midst of the American civil war. At one point Stewart’s character offers a prayer of thanks at the dinner table. He is not sure why he should be thankful to God since it is not clear to him how God was involved. wouldn’t be eatin’ it, if we hadn’t done it all ourselves. We worked dog-boned hard for every crumb and morsel. But we thank you just the same anyway, Lord, for this food we’re about to eat. 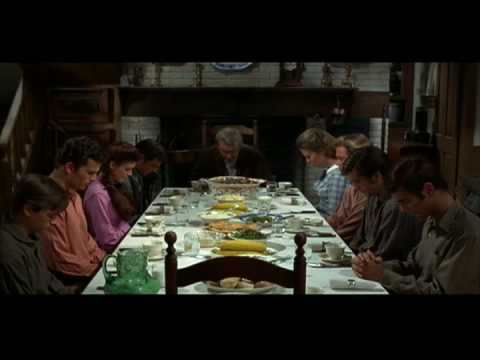 While the scene portrays the prayer as coming from a man who grudgingly gives thanks to God, it does reveal a common attitude when it comes to giving thanks. People often think they should be grateful only when they get something they didn’t have to earn or work for. Our concept of thankfulness is often predicated on what we have or what we get. This perception of thankfulness is embedded within our culture. We teach children to say “please” to get something and “thank you” once they have got what they wanted. “What do you say?” the parent asks when a child fails to respond with the expected words. Adults do the same thing. We say “thanks for calling” or “thank you” when a server in the restaurant puts a coffee on our table. It’s not that there is anything wrong with this piece of etiquette. It’s just not a biblical model for what it means to be thankful. In 1:3-4 we see that Paul’s thankfulness is not offered up because of something that he received or something that someone did for him. Paul offers thanks to God because of what God has done in the life of the Thessalonians and the way they responded to God. In fact, Paul almost never thanks human beings for anything in his letters. The only possible exception is a reference in Rom 16:4 where he expresses gratitude for Prisca and Aquila risking their lives for him. Even here it is not only Paul who gives thanks, but all of the Gentile churches which shows that Paul is thinking about the wider ministry and its focus on God. But Paul doesn’t give thanks just for past actions of God. The thanksgiving section of this letter is one long sentence in Greek (1:3-10). Within that one sentence Paul expresses thanks for what God has done in the lives of the believers and what God will do when Jesus returns. Thanksgiving for Paul is not about a gift received; it is about what God has done, what God is doing and what God will do. As followers of Jesus in the modern age our perspective on thanksgiving needs to shift from being grateful for what we are getting to what God is doing. This means that we are thankful, even in difficult circumstances. One person in history who models this is Saint John Chrysostom who was twice exiled from his home in Constantinople for speaking out against empress Eudoxia. As he died, away from his home and under persecution his last words are said to have been “Thank God for Everything!” It’s not always easy to be thankful. At times the situations of life and the cares we carry make it easier for us to forget that we should be thankful. And as we look around at the world we live in we observe a lot for which we are not thankful. But if the example of Israel and the apostle Paul means anything to us we soon realize that giving thanks to God is not based on how good we feel or how well things are going for us. Like Chrysostom, it is an attitude of quiet confidence in God that recognizes we should be thankful for what God has done, what God is doing and what God will do. One place where we can begin to rethink what it means to be thankful is by exercising it in our prayer life. And a practical step that can help reorient our perspective is using prescribed prayers. While some may be unaccustomed to using set prayers, it can be a valuable aid in directing our thanks to God away from only what we have received to what God is doing in the world and the lives of others. The Book of Common Prayer contains prayers that focus on giving thanks to God. In addition to general prayers of thanksgiving there are thanksgiving prayers for the church, national life, the social order, the natural order and family and personal life. Using these prayers can help us to thank God for what he is doing in the world. These prayers can also serve as a launching pad for our prayers as we begin with a set prayer of thanks which then prompts about specific situations for which we want to give thanks and praise to God. Another thing that we can learn from Paul’s thanksgiving section is how to express our thanks for the good things God is doing in the lives of others. Sometimes it is difficult to know how to express gratitude in these situations. On the one hand, we don’t want to pat someone on the back and tell them “Good work, you have really come far in your walk with the Lord” since that sentiment fails to recognize that ultimately it is God that is at work in the person. On the other hand, we want to be an encourager to our fellow believers in their walk with the Lord. As John Stott points out, Paul gives us an example of the best way forward. Paul doesn’t congratulate the Thessalonians for a job well done and for persevering in the midst of their suffering. Instead he thanks God for what is happening and tells the Thessalonians that he is thanking God. This may sound like semantics, but it can be another important way that we reorient our thinking about giving thanks. When we tell someone that we are thanking God for the good things in their life it helps us both recognize that the focus is not on us and that ultimately it is God who is at work in us and the world. My Google Reader list held a few interesting links today that are somewhat related to each other. Michael Bird directs his readers to a video from the Southern Baptist Theological Seminary in which Al Mohler, Denny, Burk, Russell Moore, Gregg Allison and Bruce Ware discuss the ongoing debate over inerrancy. It is interesting to watch even though I think they are tying themselves in knots at times as they try to defend the doctrine. Panel Discussion: Revisiting Inerrancy from Southern Seminary on Vimeo. Brian Leport shares a video in which Mark Noll discusses the Protestant doctrine of Sola Scriptura. Brian offers some good thoughts for discussion. Finally, Evangelical Text Criticism posted links to two University of Michigan videos that discuss how to handle and preserve papyrus, which is the material on which some fragments of the New Testament are written. It's not unusual for people to expect archaeology to "prove" the Bible. While there have been some important finds over the years that have certainly demonstrated that the biblical authors were not simply making it all up, archaeology rarely "proves" anything the way that some would like. Over at the Seven Minute Seminary Sandra Richter has a brief video explaining what archaeology can and cannot tell us about the Bible. 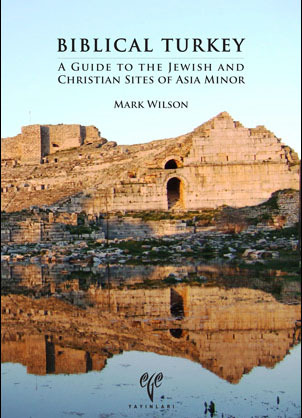 Mark Wilson's Biblical Turkey: A Guide to Jewish and Christian Sites of Asia Minor (Ege Yayinlari ,2010). Laurie, please send your details to jbyron@ashland.edu and I will mail you the book.